AMSTERDAM, 28 OKT. 2018 – A leading Dutch anti-fascist, son of a resistance fighter from WWII has been totally cleared of any wrongdoing in the case of his protest against the sale of an extraordinary expensive copy of Mein Kampf signed by Hitler himself. 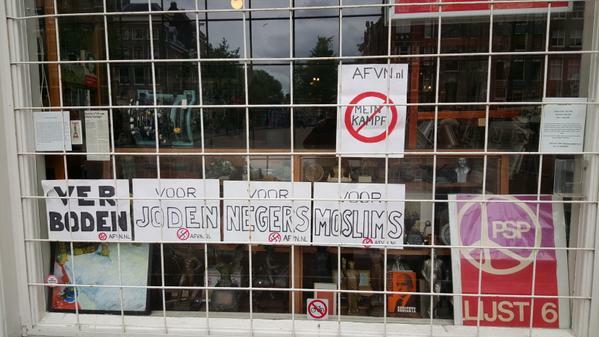 In 2015, Arthur Graaff, 70, from the Amsterdam region, had put up posters on a shop window where the book was sold, stating ‘Forbidden for Jews, for Muslims, for Negroes’. The seller first said he didn’t take it seriously, but later lodged an official complaint with the police. Last month, Graaff has been threatened with his life because of the League’s stance in the discussion on Dutch mass military murders in Indonesia netween 1945 and 1950. The police has started a criminal investigation. In 2017, a lower court condemned the anti-fascist on the grounds of insult. But the high court ruled that although insulting, this text was allowed and appropriate in this case and also contributed to the public discussion about Mein Kampf. This summes, a new Dutch translation with scientific comment has appeared, and has already had five oprint runs. The Amsterdam copy was alledgedly sold for € 19,000, making it the most expensive Nazi-item ever on the market in the Netherlands. The anti-fascists state this money should go to the victims of Nazism of the Holocaust. Graaff is spokesperson for the Dutch Anti-Fascists’ League AFVN.nl and is very happy with the outcome, becasue he sees it as support for the struggle of the league against the ever increasing sale of Nazi-items in Holland. The league has already managed to win another court case against Nazi-traders and has managed to have two Nazi sales fairs closed in 2015 and 2018. 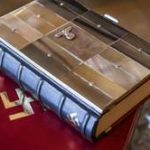 After pressure from the AFVN and a major tv-network in 2014 the Dutch E-bay subsididary, Marktplaats.nl, has come down on sales of Nazi-items and has forbidden any display of swastikas of SS-runes and the like. The league is totally against the uncontrolled sale of what it calls ‘Nazi relics’ to private persons. But control has been slack according to the AFVN and new action is needed.